One day I was getting my hair done at the salon and the stylist put the Moroccanoil oil treatment in my hair before blow drying it and I instantly fell in love. It makes your hair look smoother and feel softer, and it even reduces drying time. When I got home from the hair salon I went online and purchased myself a bottle of Moroccanoil Oil Treatment. I’ve used it every time I wash my hair since! It’s kind of expensive, runs around $40 a bottle but it seems to last along time because you only need about a nickel size worked through your hair before you blow dry it. Moroccanoil is an ultra light formula which is absorbed by the hair instantly so it does not leave a residue, and does not weigh down your hair! It even says that is can restore over processed hair damaged by environmental factors and chemical procedures, but I can’t say it has restored my hair, but then again my hair isn’t over processed. 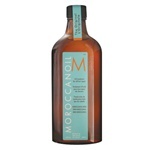 Do you use Moroccanoil? What do you think of it? Comment below and let me know! My stylist just told me about this stuff. I have this and the deep conditioner to use in the shower. Really makes my hair shine.